The Google Chrome browser recently published an update that has modified some of its automatic video play features. Unfortunately, this modification could prevent the first frame of some SafetySkills courses from playing. 1. First, try hitting the Replay button in the lower right corner of the screen. This should refresh the page, allowing the video content to resume playing. 2. 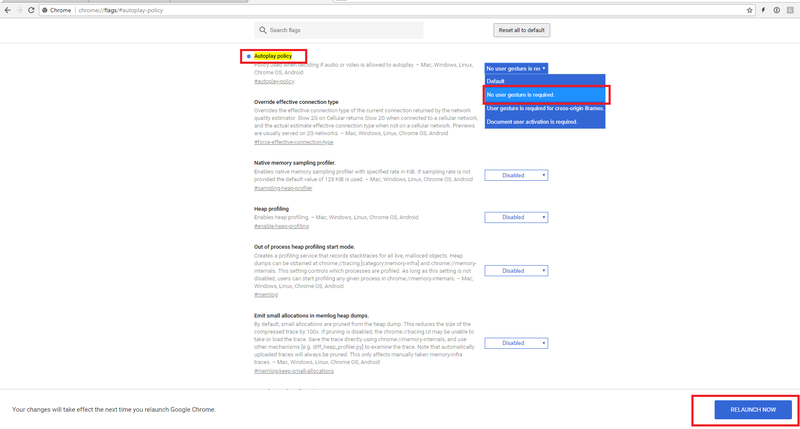 Next, you may modify your browser settings by pasting “chrome://flags/#autoplay-policy” into your web address bar. This will open a menu for Google Chrome. Click on the dropdown menu for “Autoplay policy” and change it to “No user gesture is required.” Then, you can use the button in the lower-right corner to relaunch your browser. Either of these steps will resolve the issue and the first video frame will then play properly. If you continue to experience issues, please contact SafetySkills Support by clicking on the red Support and Feedback tab in the lower left corner of your LMS.